Are you ready for a giveaway? It's been awhile since I have hosted one. Today's giveaway is from Shabby Apple! I love all the dresses, skirts and swimsuits they carry. Here are some of my favorite dresses. I love the vintage design of the dresses, don't you? will win the grand prize of a $50 Shabby Apple gift card! This giveaway is closed. The winner is Mandy. Congratulations! Oh my goodness! What a fabulous giveaway! I already LIKED Shabby Apple on Facebook, and I'm completely in love with their Alice Dress in mint. I liked Shabby Apple on Facebook and my favorite dress is the Jacobethan. Love it! Like (love really) you on facebook. I LOVE the Aloha! Their stuff is so cute. I liked 'em. I love the Atlantic Fog dress~! 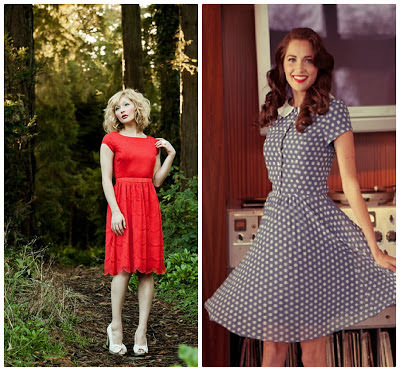 I like Shabby Apple on FB and I love the Lindy Hop dress. I follow you on pinterest! I like you on Facebook, and I liked Shabby Apple in Facebook!I would get the OVERBOARD dress! so cute! I like Shabby Apple on Facebook. I love the Alice dress! I Follow Whatever DeeDee Wants on Google Friend Connect! I already liked Shabby Apple on FB. Love the Cotton Candy dress! I love shabby apple and already follow on Facebook. LOVE the desert modern dress!! Thanks for the giveaway! I like the TWIN PALMS DRESS!!! I like Shabby Apple on FB and love the Class Ring dress! I like Shabby Apple on Facebook, and love the Rodeo Drive dress. Thanks for the giveaway! I like Shabby Apple on Facebook and my favorite Shabby Apple item is the "I'm Late! I'm Late!" dress. I don't do FB, but I do follow you on GFC. May I still enter? liked shabby apple on facebook :) i love the alice dress in blue!